Com Invest is a company whose main object of activity is “the selection and the placement of the labour force”. We place students, graduates, specialists in countries from all over the world. The programs that we offer are: working programs (Work and Travel, Seasonal Work), cultural and exchange programs (Training, Aupair), study and travel programs. The main countries are USA, UK, Australia, Germany, Spain, Holland, Belgium and France. Having a progressive activity, the company currently has 2 offices: Cluj-Napoca and Sibiu, and has collaborators in over 10 cities in Romania. Our staff, characterized by professionalism and being trained in this field won the national and international reputation of the company, as well as the consideration of our applicants. 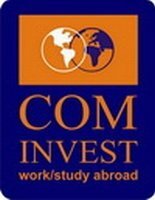 The services offered by Com Invest include: selection and placement abroab, insurances, bookings and purchases of flight ticket, ISIC (International Student Identity Card), IYTC-International Youth Travel Card, ITIC (International Teacher Identity Card), free advice regarding the international and international trasportation means on land, embassy programming, embassy forms and types of visa. In order to promote and manage the above mentioned programs, Com Invest has tight relations with the embassies as well as the foreign associate organizations. Please visit our page for further details about the programs and services that we offer for the 2008-2009 season and feel free to contact us! Thank you for choosing Com Invest, Work/Study Abroad!"